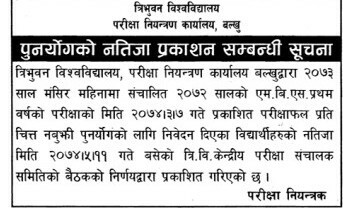 Tribhuvan University (TU), office of the controller of examination has published the re-total result of Master of Business Studies (MBS) First Year of the examination that was held on Mangsir, 2073 BS. The re-total result of MBS First year was published by the decision of Tribhuvan University central examination committee, whose meeting was held on 11 Bhadra, 2074 [27 August, 2017]. The result of MBS First year year was published on 7 Ashad, 2074 [21 June, 2017]. Students can view the results of re-total by visiting exam controller office, Balkhu. 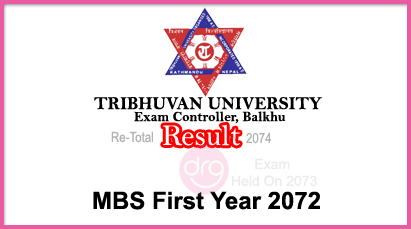 1 Response to "Re-Total Results Of MBS First Year 2072 Published | Exam Held On 2073 | Tribhuvan University"